Mothers. They are probably the single most important group of people in the world. It’s not that I’m belittling the role of fatherhood, or demeaning the amazing work that fathers do for their children, but simply put, we wouldn’t be here if it wasn’t for the tireless patience and sacrifice of our mums. Nine months of nausea, sore breasts, swollen appendages and having your organs used as punching bags. Then there’s the trauma of birth itself, which is rewarded with the full-time care of a screaming, incessantly ravenous alimentary canal which has taken the form of a baby. Over the years, the screaming and the pooping become slightly more manageable, but most mothers remain the head chef, playmate, laundromat, ironing lady, teacher, taxi-driver, nurse and drill sergeant for their offspring. Today, Dr Leaf added one more thing for mothers to feel guilty about – smartphones. Dr Caroline Leaf is a communication pathologist and self-titled cognitive neuroscientist. Credit where credit’s due – in the past, Dr Leaf has pathologically avoided citing her references, but today, she cited the article itself and the news story that promoted it. But again, like the meme she posted a couple of days ago about sadness making people sick, Dr Leaf has posted the opening paragraph of a promotional PR puff piece and made it sound like a scientific pronouncement. When you actually read the journal article that the news story is promoting, it has nothing to do with smartphones. Or indeed, human beings. The research was performed entirely on rats. The research itself, by Molet and colleagues , seemed entirely legitimate. The rat pups raised in a more chaotic way appeared to have higher levels of anhedonia, because they didn’t engage as much in the things that rats normally find pleasurable, namely, drinking sugar water or playing with their rat buddies. Not using smartphones would improve outcomes. There’s no evidence from this study, or any work that I know of, that definitively proves any one of these things. There are a number of alternative explanations as to why those rat pups weren’t as happy as the control group, but even if the chaotic nurturing of the rat babies was THE cause of their unhappiness, human beings are completely different to rats in cages. And there are many things, other than smartphones, that can strain the mother-baby relationship. Excessive mother guilt for one. Dr Leaf’s meme is a good example of just how misinformation can spread quickly through the internet. The PR department of a university writes a puff piece on the article to promote the university and its research. But no one wants to read about depressed rats – they need a better hook. 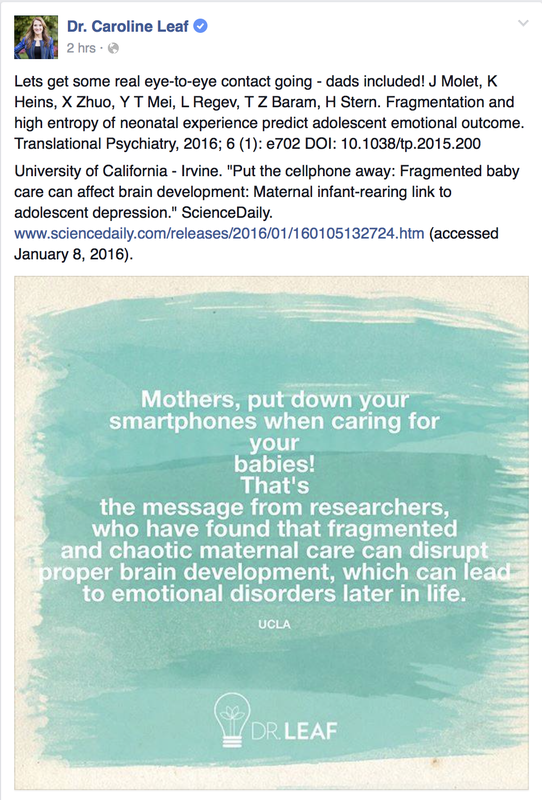 There’s a love-hate relationship with smartphones in our culture, and lots of Mommy-guilt, so they use a sentence about smartphones and mothering to grab people’s attention, even though the journal article had nothing to do with either. Science Direct then simply republished the press release from the university without filtering it, where it’s then picked up by wannabe scientists and self-titled experts like Dr Leaf, who pass on the misinformation to hundreds of thousands of their followers. Pretty soon, mothers everywhere are feeling guilty about looking at their phone instead of their children’s eyes, when it probably doesn’t make a blime bit of difference. Unless you’re a rat, there’s no evidence that using your smartphone makes you a bad mother. Be wary of social media memes, and what you read on the internet. Dr Leaf is hurting her own credibility by reposting the opening paragraphs of sciencey promotional PR articles instead of reading the actual article first. We need experts to reduce the amount of misinformation clogging the internet, not increase it. Molet J, Heins K, Zhuo X, et al. Fragmentation and high entropy of neonatal experience predict adolescent emotional outcome. Translational psychiatry 2016;6:e702. This entry was posted in Biological, Caroline Leaf, Psychological and tagged anhedonia, caroline leaf, criticism, Facebook, false teacher, meme, mother guilt, rats, Science Direct, smartphones, social media, Translational Psychiatry by cedwardpitt. Bookmark the permalink. Let us love one another as He loved us, if not by laying down our lives, atleast then by laying down our points of argue and opinions. apologies, for not having an email. Good morning ‘Sister’. Blessings to you too. Please be assured, there’s nothing to apologise for. I appreciate your contribution. “Do not be led away by diverse and strange teachings, for it is good for the heart to be strengthened by grace, not by foods, which have not benefited those devoted to them” (Heb 13:9). I write to promote maturity and wisdom within the Christian church, and to uphold sound doctrine. I love God, and I love his church, and I hope that those willing to open their minds will see that in opposing the misleading teachings of Dr Leaf, I am promoting maturity and care for the vulnerable within the body of Christ. Thanks again for taking the time to contribute. Please pray for Dr Leaf and myself, and for the strength of Christ’s church.